Nice farmhouse and outbuilding dating back to 17th century which have been tastefully restored preserving the ancient charm, beauty and the original architectural features like the beamed ceilings and the terracotta-tiled floors. Located between the Val d'Orcia and the hills of the Sienese Chianti, the farmhouse is on two floors: the first floor is accessed by an ancient stone staircase and a small open gallery that lets into a spacious dining room with a Tuscan fireplace, three bedrooms and two bathrooms. On the ground floor there is a living room with stone flooring, dining room, complete bathroom and a fully equipped professional kitchen with dishwasher, fridge, fireplace and brick barbecue. On request possibility of cooking courses, wine tastings of the best Sienese wines and typical Tuscan dinners. The farmhouse, furnished with style and elegance, preserves the ancient terracotta flooring and wooden beamed ceilings and is part of a seven hectare estate composed of land and forest, surrounded by a large private garden with swimming pool, sun deck with river sand, and a small pond. Not far from the house are the stables with the owners’ horses and their pastures. 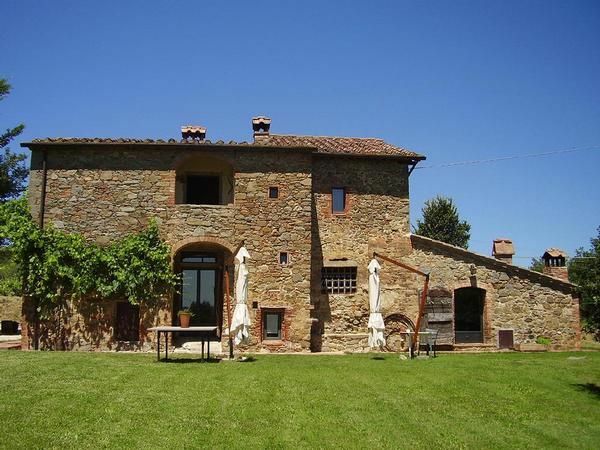 Thanks to its superb location the farmhouse is the ideal starting point to visit the Val di Chiana and Val d'Orcia with its wonderful medieval towns such as Cortona, Montepulciano, San Quirico d'Orcia, Pienza, as well as Montalcino and San Gimignano and the beautiful art towns of Siena, Florence and Arezzo. An ideal place for a relaxing holiday, taking long walks in the woods or visiting the most beautiful and striking sites of Tuscany. the farmhouse is almost entirely self-sufficient for its own needs and those of its guests thanks to the installation of a photovoltaic and solar thermal system, as well as rainwater harvesting, which helps to offer guests a relaxing and totally eco-friendly vacation. Situated in the heart of Tuscany, near the centre of the little town of Sinalunga, it is an ideal spot for exploring the natural and artistic beauties of the two central regions of Italy, Tuscany and Umbria, as it is not far from the highway connecting Perugia and Siena. Both localities can be reached in less than an hour. The A1 motorway exit Valdichiana is a few kilometres away, permitting easy and fast travel in all central Italy. The property uses the railway station of Sinalunga, connected with the more important one of Chiusi. Internet: per object and day Costs amounting to 5 EUR (optional). Heating: per person and day Costs amounting to 10 EUR (optional). Cot for children: per person and day for rent at a price of 6 EUR (optional). Cot for adults: per person and day for rent at a price of 40 EUR (optional). Cot (per person and day, to be done by tenant 6 EUR). Cot for adults (per person and day, to be done by tenant 40 EUR). Heating (per person and day, to be done by tenant 10 EUR). Pet (per property and day, included in price 6 EUR).